We can create servers easily from within a browser; there are also several automated mechanisms available. As a result, building and operating our systems is now easier. Bandai Namco Studios Inc. began as an independent offshoot of Bandai Namco Games Inc. in Japan. The company develops arcade games, platform-specific software, and social and mobile games. The engineers at Bandai Namco are driven by an insatiable passion for play. Drift Spirits is a smartphone game that was released for iOS in November of 2013 and for the Android platform in May of 2014. It is free to download and play. Bandai Namco Studios was responsible for its development, and Bandai Namco Games for its publication. Because Drift Spirits incorporates social gaming elements, Bandai Namco Studios anticipated during development that the number of users and server access would fluctuate widely over short periods of time. Adding and modifying server resources in-house would be time consuming, and the Bandai Namco Studios team was concerned that it might fail to meet the service needs of game players. There was also the issue of administering and operating dozens of online servers. Given these issues, the studio began discussing the use of Amazon Web Services (AWS). The company decided that using AWS would not only enable it to rapidly add and modify servers, there would also be other benefits, including better performance, lower costs, better security, and greater availability. In particular, Bandai Namco saw the potential benefit in terms of reductions in overhead, especially when it came to adding, modifying, and removing server resources. Building its systems involved a combination of services that seemed particularly well-suited to those challenges, including Amazon Elastic Compute Cloud (Amazon EC2), Amazon Relational Database, Amazon ElastiCache, Amazon Simple Storage Service, and Amazon CloudFront. 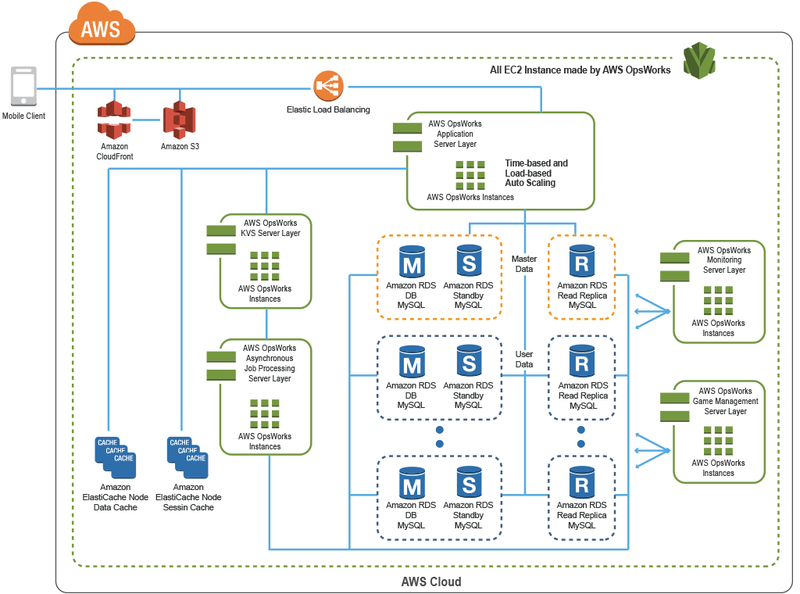 And when it came to configuration management and operations, AWS OpsWorks offered complete coverage from the development to the production environment. The settings needed to configure Bandai Namco's servers are defined using Chef cookbooks and custom JSON attributes with OpsWorks. All it takes to add a new environment is to tweak the custom JSON, enabling the company to deploy environments incredibly quickly. Bandai Namco has configured many development environments to enable developers to develop and test multiple versions in parallel. Furthermore, all Amazon EC2 instances running in the production environment are launched using OpsWorks. Shigeo Nakano, director of network entertainment development at Bandai Namco Studios, says, "Using OpsWorks to automate the configuring and running of servers enabled us to cut costs, particularly in terms of personnel and server expenses. This is extremely beneficial." And because Bandai Namco's engineers can rapidly add, modify, and remove server resources timed with game events, they have been able to speed up release dates and support an increase in the number of monthly active users 100-fold during events. It was also possible for the company to minimize server latency issues specific to server-response speed. Nakano says, "When we anticipated the load increases that might occur with the release of the Android version, we were able to quickly put together a load test environment using OpsWorks, perform pre-testing, and then bring on the necessary resources and modify them. We were also able to trigger server program responses. That was of great assistance to us." He continues, "The cost benefits are also impressive when you consider that we are now able to temporarily create a large number of servers for testing and then, once testing is complete, immediately halt the use of servers that are no longer needed." The company is also realizing server-cost savings through the use of OpsWorks. Because the fee structure for AWS servers is based on usage, Bandai Namco can restrict operational costs by halting the use of servers that are no longer needed. For example, AWS enables the company to cut the number of servers by upwards of 50 percent late at night, when server access is low. Nakano says, "Our use of AWS keeps our operational costs lower and dramatically reduces the effort involved in administering and operating server configuration. As a result, we were able to spend more time focusing on application development during the Drift Spirits project." By using OpsWorks, Bandai Namco can now easily handle sudden increases in traffic. OpsWorks offers a feature that enables additional servers to be brought online when needed as a result of load-based sever state monitoring. A determination of potential server resource depletion will occur, for example, when server CPU use rates reach 65 percent for periods exceeding five minutes. When that happens, additional servers are automatically brought online. This prevents latency issues. Additionally, use of the time-based, load-based, and non-stop operation features in OpsWorks allows the company to adjust the number of servers in advance of known launches and promotional events. "We recommend that anyone with an interest in AWS try it out," says Nakano. "Because you can create servers easily from within a browser, and because several mechanisms can be automated, you can both take advantage of AWS at the simplest level and use it in more advanced ways." To learn more about how AWS can help you with configuration management, please visit our AWS OpsWorks detail page.